Packers quarterback Aaron Rodgers fires a pass to Jerry Kelly on the fairway of the second hole during the first day of the Cologuard Classic pro-am. The pro-am resumes Thursday. Despite cool and rainy weather, fans of Packers quarterback Aaron Rodgers came in droves to watch him play. “We have a great fan base. I’m not surprised they are here,” Rodgers said. Aaron Rodgers invites Michael Shipley, 13, inside the fairway ropes for a picture Wednesday at Omni Tucson National. Football and golf fans donned their green and yellow shirts and hats for Wednesday’s Cologuard Classic pro-am. Aaron Rodgers, the man they were there to see, stuck out. “I like blue, white and grey,” the Green Bay Packers quarterback said, showing off his golf gear. What about green and yellow? 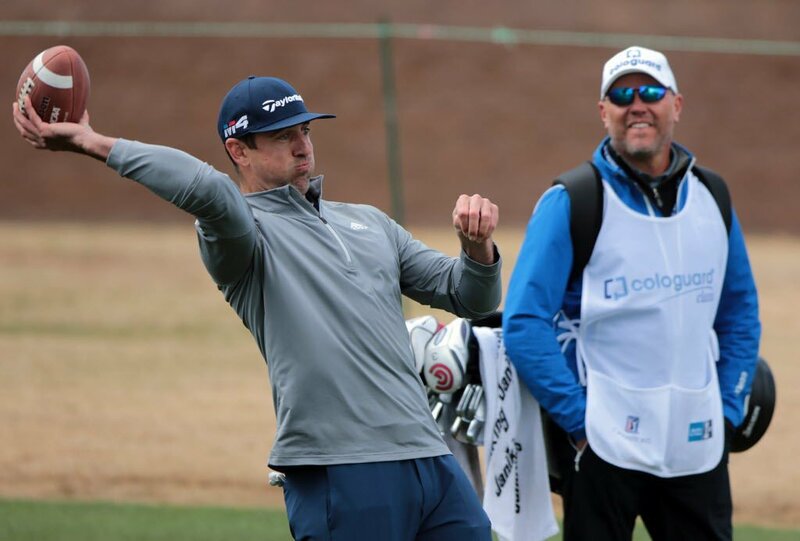 Rodgers was the star of Wednesday’s pro-am, edging out new UA football coach Kevin Sumlin and baseball Hall of Fame-bound pitcher and former Wildcat Trevor Hoffman. The Rodgers mania began on the practice tees and continued after every hole. The NFL star did the best he could to sign as many jerseys, hats and footballs as possible. Brandon Haney and his son, Ethan, drove from Gilbert to meet Rodgers. They came with a special request. Ethan’s friend and Higley High School football teammate, Marcus Edwards, is recovering from surgery to remove a brain tumor. The Haneys asked Rodgers to sign a hat and — if he could — contact Edwards. 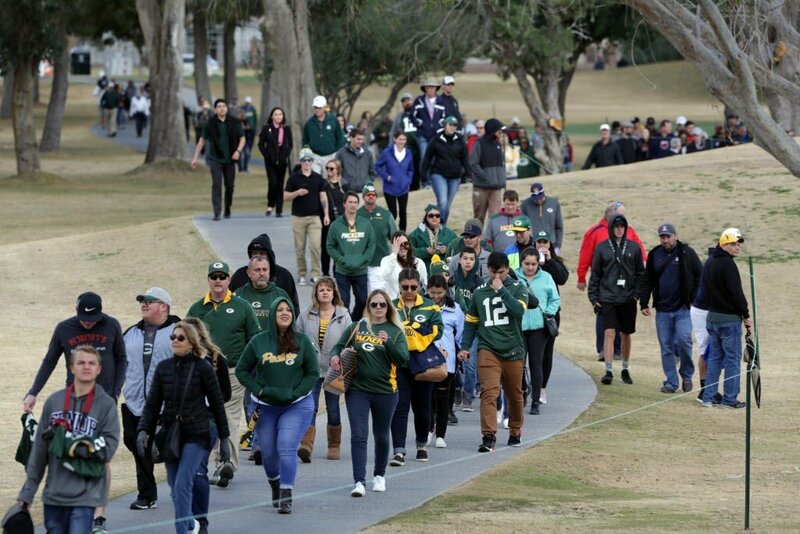 Glenn P. Howell, a Tucson Conquistador who accompanied Rodgers’ group in a golf cart, said that he has “never seen someone more gracious” with the fans. Taylor Vegors wanted to videotape Rodgers telling her dad, Paul Villarreal, that she was a few months pregnant. Rodgers said he “felt a little pressure” but delivered. Rodgers played in PGA Tour Champions player Jerry Kelly’s group. They were joined by Kevin Conroy, the chairman of Exact Sciences, the company behind the Cologuard. Kelly and Rodgers also teamed up for the pro-am at the AT&T Pebble Beach a few weeks ago. The golf is fun, but Rodgers said the time together means so much more. During the round, Kelly gave his partners tips on their swings and occasionally teased them. Rodgers shared his workout routine of 100 burpees, 100 crunches, 100 squats, and 100 pushups with his group, then immediately hit into the sand on the No. 11 hole. Hoffman also drew crowds during his pro-am round. He played alongside pro golfer Scott Verplank, UA president Robert Robbins, Wildcats associate athletic director Mike Ketcham and Sumlin. As Hoffman’s group approached the 12th tee, a resident who lives along the course blasted “Hells Bells” by AC/DC — the song that would play when Hoffman entered a game for one of his National League-record 601 saves. Tucson’s Francis Bailey, a San Diego native, claimed responsibility. Hoffman’s group asked Bailey to start the song over again when Hoffman stepped to the tee. After the round, Hoffman admitted he played better than he thought. “It was a fun day,” he said. “It was good to be around Scott to see his pace and how he plays. It was hard to golf when my feet are still hovering off the ground (from being elected to the Hall of Fame). This was Hoffman’s first time back to Tucson since hearing he was elected to the Hall of Fame. Because of expected frost in the morning, Thursday’s portion of the pro-am will be a double-shotgun start at 8:15 a.m. and 1:15 p.m. The 8:15 participants include Colin Montgomerie (starting at No. 1), Jose Maria Olazabal (No. 9), John Daly (No. 10) and Jesper Parnevik (No. 18). The 1:15 participants include Hale Irwin (No. 1), Tom Lehman (No. 1), Steve Stricker (No. 9), David Toms (No. 9) and Mark O’Meara (No. 10). The 2018 Cologuard Classic, an Official PGA TOUR Champions Event, at Omni Tucson National Golf Resort. Teams will meet in first round of Pac-12 Tournament at 9:30 p.m. Thursday in Seattle.